Local MLA and Consumer Affairs Minister Sadhan Pandey visited the area along with special teams of KMC and the health department on Saturday. 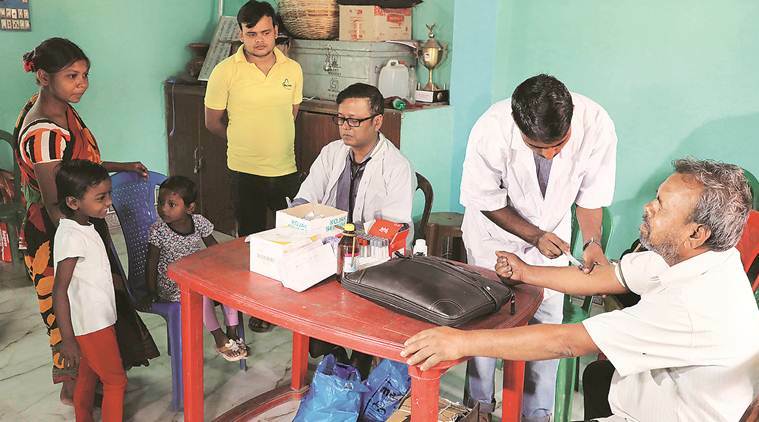 Special teams from the Kolkata Municipal Corporation (KMC) and the health department visited Basanti Colony in Ultadanga Saturday after two persons, including a seven-year-old, reportedly died of Scrub Typhus disease in last one month. The KMC has also set up a medical camp in the area. Scrub typhus is spread to people through bites of infected chiggers (larval mites). The most common symptoms of Scrub Typhus include fever, headache, body aches, tiredness and sometimes rash, said Dr Arindam Biswas. “What took me by surprise is that the disease surfaced in a metropolitan area. It is generally seen in rural areas. This is worrisome and alarming. The health department and the corporation must work hand in hand to ensure it doesn’t spread further,” he added. Scrub typhus, caused by the bacterium Orientia tsutsugamushi is the latest vector-borne disease to hit West Bengal. While the government has been quick to react, a senior health official underlined the need to focus on the cleaning of garbage and waste management efforts across the state. “The work of the civic body should not be limited to buffing up areas that are already better managed, but must aim to keep slum areas clean. If the Corporation does its work well and proper hygiene is maintained across the city, such outbreaks can be prevented.” On the positive side, with the penalty for littering being raised by an amendment to the Kolkata Municipal Corporation (Second Amendment) Act that was passed by the Assembly on Thursday, Kolkata can be expected to be cleaner city, and therefore, better protected against the spread of vector-borne diseases. The penalty for littering has been raised to between Rs 5,000 and Rs 1 lakh from the earlier Rs 50-5,000. Besides the medical camp by the KMC, senior officials from Beliaghata ID Hospital have also been conducting an awareness campaign to ensure people are not misguided about the disease and proper treatment could be given to them. No single area has ever reported so many cases of Scrub Typhus at once in Kolkata. Local MLA and Consumer Affairs Minister Sadhan Pandey visited the area along with special teams of KMC and the health department on Saturday. The team included Dr Dipankar Maji, executive medical officer of borough 3 of the KMC, Sourabh Chatterjee, medical officer of Ward 32, Dr Rehena Sarkar, microbiologist, senior officials of Beliaghata ID Hospital and laboratory technicians. The KMC officials have also undertaken a drive to clean the area. Locals are, however, not convinced with the efforts of the corporation. “Now that people are dying, suddenly the health officials have swung into action. The KMC service is otherwise extremely poor here. No one ever bothers to clean the area. My daughter had fever but luckily she was treated timely,” said a local resident on condition of anonymity. “Since the disease spreads through insects or rats, we have been campaigning in the area so that people maintain hygiene. Many people lack awareness. Despite corporation staff regularly cleaning the area, locals throw garbage on the road. We have also requested them not to litter,” the local councillor said.